A duo of marine oils quench the skin and prevent water loss while natural plant oils replenish lipids, giving a nourishing effect. This golden dry oil enhances the natural beauty of the face, body and hair, leaving a soft, satin finish. A duo of marine oils quench the skin and prevent water loss while natural plant oils replenish lipids, giving a nourishing effect. Buriti Oil provides an antioxidant action while contributing to the subtle, golden glow and finish. 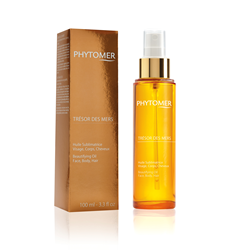 Designed for all skin types, TRÉSOR DES MERS Beautifying Oil can be used daily, morning and/or evening on dry or damp skin. It absorbs quickly into the skin while leaving a sophisticated scent of jasmine, bergamot, white flowers, vanilla and coconut. A complement to any season, this golden beauty elixir deeply moisturizes skin while repairing, dry and brittle hair. Directions for use: spray on face, body and hair. Apply all year round, both summer and winter. Mekabu Oil - extracted from Weaving Algae, a laminaria algae with exceptional moisturizing properties. Reinforces cell cohesion and epidermal-dermal connection to limit water loss in the skin. Glasswort Oil - improves moisture circulation and storage of water and urea in the epidermis while strengthening the lipidic barrier. Sesame and Macadamia Oil - intensely infuses the skin with essential unsaturated fatty acids to replenish lipids in the skin. Buriti Oil - high in antioxidant carotenoids, which gives it its red-orange color. Traps free radicals and protects cells against free radical attacks.